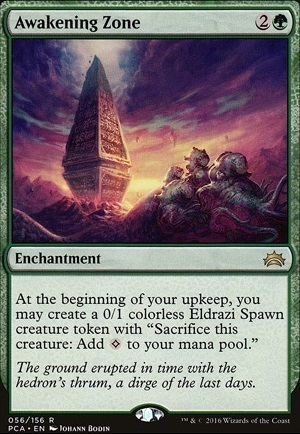 At the beginning of your upkeep, you may put a 0/1 colorless Eldrazi Spawn creature token onto the battlefield. It has "Sacrifice this creature: Add to your mana pool." 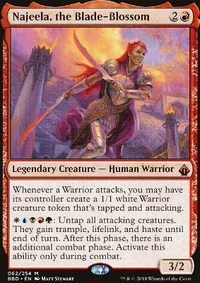 Awakening Zone , From Beyond , Master of the Wild Hunt : These all give you a token per turn, which is generally better than having to pay mana for tokens in my opinion. Eldrazi tokens also give you extra ramping utility even if you aren't swarming your opponent with them. 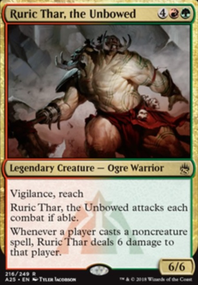 There are also lots of great token producing planeswalkers like Garruk, Primal Hunter or Nissa, Voice of Zendikar to name a few. I also think it would benefit this deck to have more ramp/mana dorks. Green has so many options in these categories. 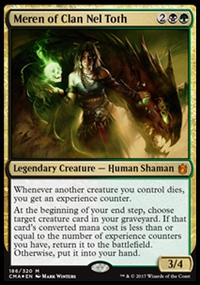 Ramping up to your commander is essential once you get some tokens. I'd suggest Primal Vigor or Doubling Season if you're okay with spending some cash to get them. 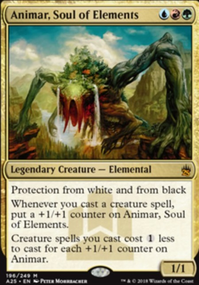 Ramp is never an issue, it looks like it should be but tutoring out Sakura-Tribe Elder , Yavimaya Elder or Solemn Simulacrum will get you the endless mana nearly each turn due to our great leader Meren of Clan Nel Toth . Additionally, having eldrazi scions being created by Awakening Zone and From Beyond tends to give me the edge to have a bit more mana, but I tend to usually just use them as a sac outlets due to the mana flood in nearly every game. As for the suggestions: Pattern of Rebirth is an amazing card which I used before! but by the time I enchant one of my creatures with this, someone always removes it before it gets attached or exiles it before I can sac it or kill it, the card Journey to Eternity Flip is what replaced it. It may not tutor a creature out but boy does it sure allow for more recursion. Songs of the Damned is risky, when everyone plays gravehate you may be expecting a dead card in hand for a quite a while, never liked it, never will. Blasting Station was also in the deck, but without any infinite combos and relying on this as a sac outlet was not so great, it ended up being removed for Krav, the Unredeemed which happened to be a greater sac outlet, card draw engine as well as a life gain mechanism. And the second vampiric tutor has been removed, it was placed there by accident as I got an altered art version and failed to see I didnt remove it. Thank you so much for your suggestions! If you have anything else please don't hesitate to comment!